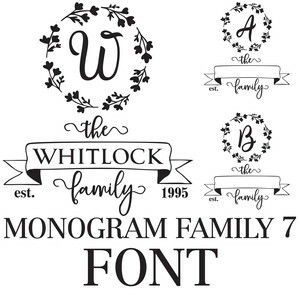 Includes all 26 letter monograms. Simply fill in the name and year they are it's ready to cut and create with. For ideas and inspiration visit www.loriwhitlock.com and www.facebook.com/lori.whitlock.studio. For Lori's video tutorials visit www.youtube.com/loriwhitlock. For a full tutorials list visit www.loriwhitlock.com/blog/tutorials.